Czech music from the Upper Midwest USA! 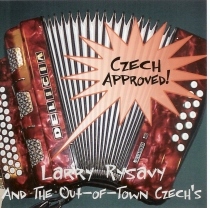 Larry Rysavy and the Out-of-Town Czechs is a band that combines musicians from Minnesota and North Dakota. They certainly have fun and are definitely Czech. Enjoy this American Made Czech music direct from the Upper Midwest of the USA! This is their first album.